Happy New Year to anybody who hasn't already heard these words from us. 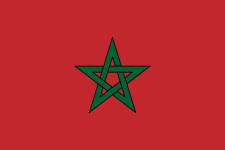 This posting replaces one in which our Flash page provided a link to our holiday greetings. Now it's time for the Chinese New Year, or Spring Festival as most Asians call it. The Year of the Rabbit starts on February 3. So to all our Asian and non-Asian friends our standard Cantonese greeting: Gung Hei Fat Choi! Our last posting, October 8, was three and a half months ago. A short period by our recent standards. Then we were half-way through our stay in Brussels. After that came five weeks in Darlington and London; we were hindered getting there a bit by the weather but we managed that. After cold England we were looking forward to warmer climes: Florence, Italy. That's where we are reporting from; so far we are really enjoying it. Although not warm by absolute standards it is warmer. Click on any photo below to see it enlarged. It will appear as part of a slide show of all photos on this page. The image size can be changed by clicking on the plus and minus buttons. In the upper-left corner of a slide show click on either of the small-blue triangles to see another album (sets of photos). One of the albums is of us in Florence in January-February. 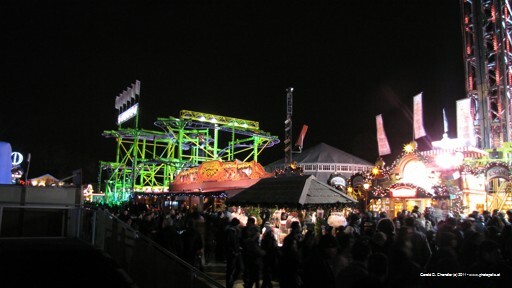 Two more show us in Brussels last year and us in Japan even earlier in 2010. What happened in our last seven weeks in Brussels? Lots and lots; for all the details you have to wait. 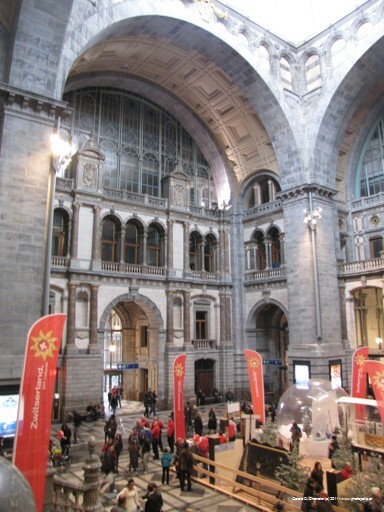 We have, however, posted lots of photos of Antwerp We, or more precisely, Gerry, never got into good enough shape to do much bicycling so we mostly walked and took the tram. 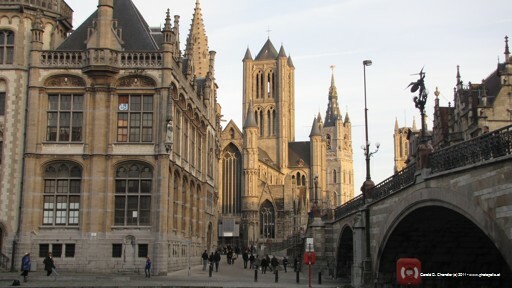 Three of the more memorable of our later experiences were our visits to the Atomium, to Ghent, and to Antwerp. 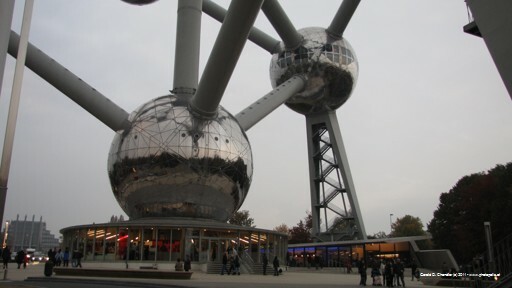 Gerry had his heart set on eating breakfast in the Atomium, the symbol of the 1958 Brussels World Fair. Early one morning we set out, driving the Ellis' car. We quickly learned that rush hour in Brussels is terrible and as the result of a flat tire we learned how to get a new one. The next day, using public transport, we made it to the Atomium, but the fog was so heavy that from just 200 m away we couldn't see the giant Iron atom. Third time, delayed a few more days, was lucky and we overstuffed ourselves on a Belgian breakfast. Our three weeks in Darlington went by in a whirl. 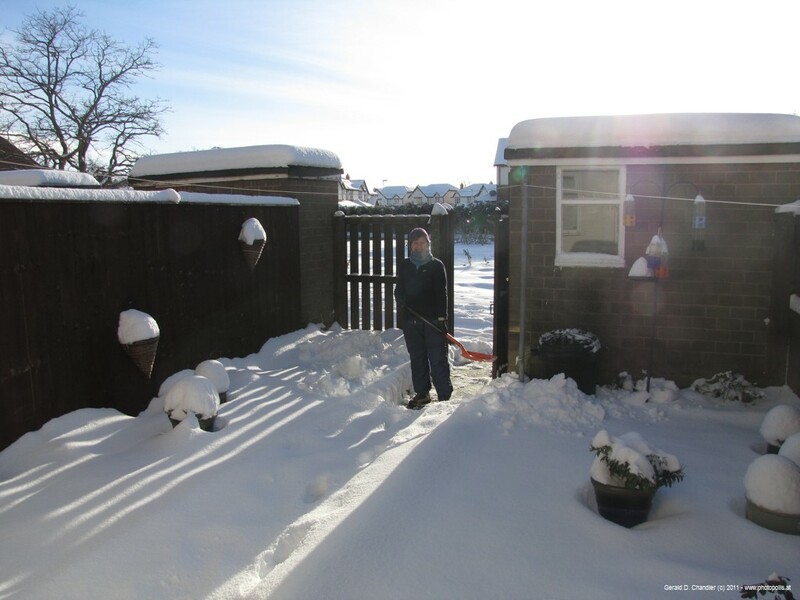 The first day we enjoyed walking through the snow to Morrisons to do a "fill up the larder" shop. And we enjoyed shoveling the front and back walks. we had lots and lots of time with all of the Bates, even treating most of the siblings to a home cooked meal, a la G & J. Besides that eating we first went through lots of good Thai stuff left behind by Jhap in the freezer and then went through lots and lots of chocolate, left behind by Dave and then given as gifts to us. 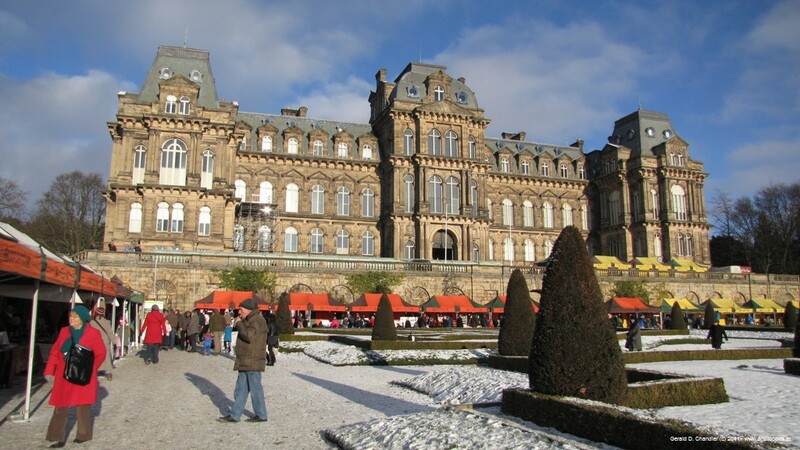 One day we were taken 12 miles out of town by Jan's sister Joan and family to the Bowes Museum Christmas Market. Cold! Brr! 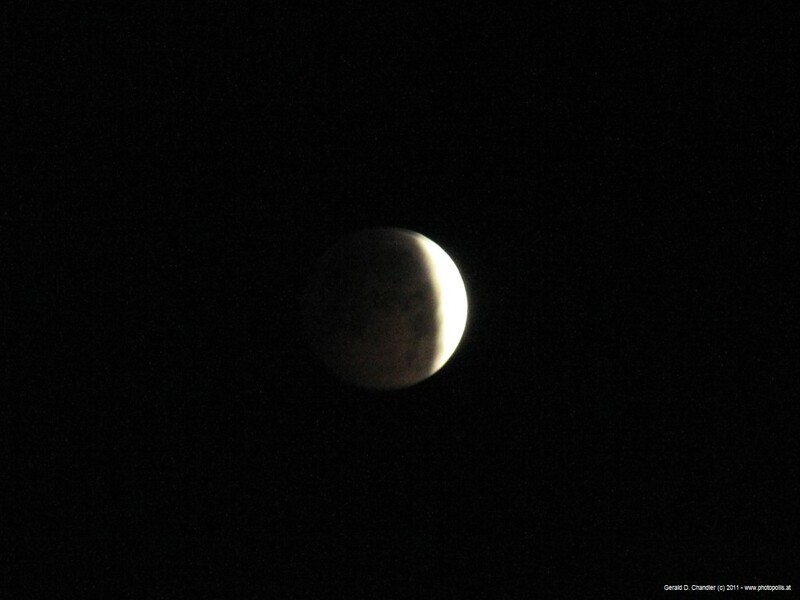 And just before we left we got up early to see the eclipse of the moon. Cold! Brr! When we left Darlington — or wanted to leave — the weather had gone from bad (on our arrival) to good (for a week) to bad again. This time it was to be the National Express bus to London. In the two days before departure many buses and trains were cancelled. On our departure day none of the trains of the north-east coast were running. And as we waited on Feethams Street in central Darlington for a bus that didn't appear it seemed that ours wasn't to run either. But 30 minutes late it arrived and only 15 minutes late it deposited us at Golders Green, on the northern side of London. When people start a business they often initially have a rough time and then after years get a steady clientele that knows them. We've sort of done that with regards to places to stay: now we get unsolicited inquiries of whether we'd like to house sit. So far, we always have said yes. And that's how we got a two-week house sit in London's Hampstead Garden Suburb, about 6 miles (10 km) north of the center. It worked out very well for us, giving us a chance to leisurely see some friends and make acquaintance with a half-dozen new museums, etc. We particularly liked visiting the Wallace Collection, the Courtauld Gallery, the Victoria and Albert Museum, and the John Soane Museum. 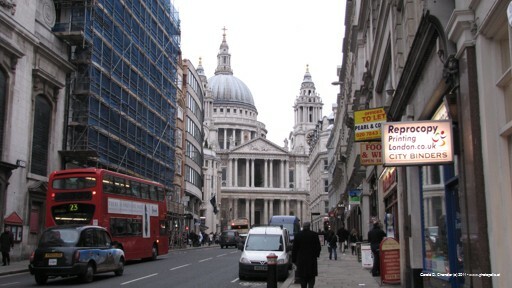 We almost always rode the bus into central London; although much slower than the tube the hour ride was well worth it as we got to see lots and lots. We passed through Trafalgar Square and on Oxford Street and Regent street and their elaborate Christmas decorations almost every other day and that too was fun. 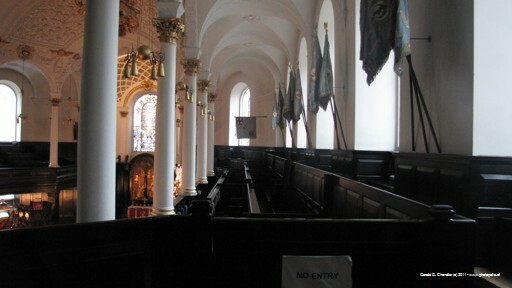 And several times we just set out to walk around a district and see what was there; that's how we got to see some wonderful old churches, parts of the Roman wall, and many things along the Thames. London 2010 will be memorable for the Christmas meal we had with friends (already reported in the cover letter to our Annual Letter) and the continuing cold. And, for the fact that for the second time in just four weeks Gerry fell and hurt himself. The first time was in Darlington, when he slipped on ice and ended up with a left arm pretty useless for two days. The second was the night before we left London when he fell and poked his back with the end of the bed: he completely lost his breath on that and was useless for 24 hours. He did manage to help a bit in getting us to Heathrow and on to Florence. We flew from Heathrow to Zurich and then on to Florence. In Zurich we were surprised to find that we went through immigration; after the fact we realized that Switzerland is now part of the Shengen zone; the first place one touches ground in Shengen is where one goes through immigration. Fortunately we didn't have the problems we had in 1978 when Jan made her first trip to the US, coming from Japan. She was held up at immigration in Hawaii so long that we missed our flight. From Florence airport we went, not rushed at all, to the apartment we'd arranged via Craigslist. First there was the airport bus to the main train station, Santa Maria Novella, and then — with a bit of confusion and forced pidgin-Italian — a local bus the 4 km to our new home in Gavinana. Our new land lady was very gracious and welcoming and after a pleasant talk with her in French, English, and even Italian, we started to settle in. Our first few days here we stayed close to our new apartment because of our back problems: On the journey here, because of Gerry's problems, Jan did double duty in carrying bags and just at the moment of getting on the last bus hurt her back. But after two days we were well enough to not need to restrict ourselves to short walks and went off to see the really famous and historic places. What to see first? Well, we didn't really care. On the one hand we'd seen all the famous stuff before, in 1981, on the way to Hong Kong. But we didn't remember a thing, except perhaps the doors to the Baptistry. And, given that we had three months ahead of us instead of 3 days we were sure that we'd fit it all in. 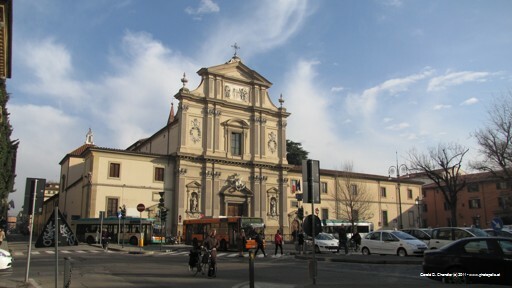 So we took the first bus and it took us to San Marco Plaza and there we went into a wonderful church, Chiesa San Marco. And that was the first of many wonderful things we've seen so far in Florence. 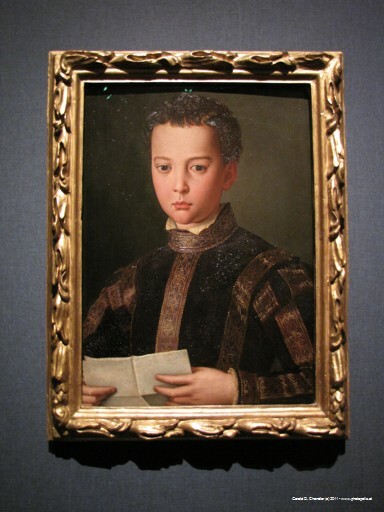 Among them were many painters unknown to us, for example Bronzino whose work we saw at a special exhibit. 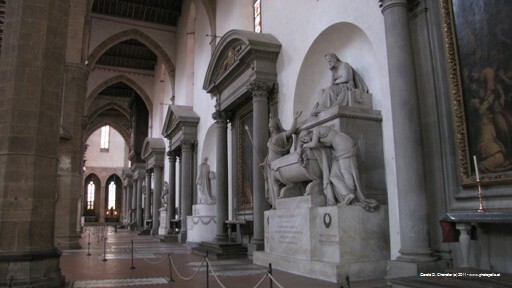 And there were church-museums, such as Santa Croce, which we visited by attending mass. We'll write up more sometime. Here, let us just say that we are enjoying going out when we want, and just as important, staying in when we want. Already we are practicing Italian by reading and watching the TV. It seems comparatively easy for an English speaker, easier than French and maybe even easier than Spanish. But maybe it's just because we already know these two languages that we have a good leg-up on Italian. As usual we are wondering "what next"?. The first thing is that we have already extended our stay here in Florence from just under three months, to just under four, so we now leave here at the end of April. Maybe things have come together and maybe they haven't: everything is iffy. 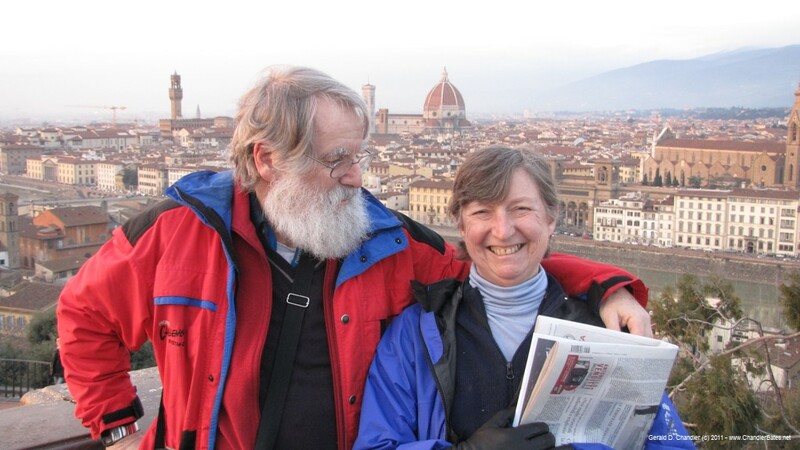 But if things work out as we hope we'll leave Florence in early May and spend two more months in Italy. However, there is a small chance that we'll spend June in Mallorca for sort of a house-sit; after that we'll be guests of friends in Switzerland for as long as we like, which means most of July. The last — and big — open question is if we'll go back to Veronica's in Paris for August-September-October. We have our fingers crossed. As usual que sera, sera or maybe (please excuse the poor Italian) quello che sarà, sarà.